If you follow me on snapchat/instastories (both @katiewkrysh) then you have probably seen me post about the ketogenic (keto) diet. I have heard a lot of great things about this diet the past few months and decided to give it a try because I was really intrigued by the concept and the different foods you can eat. They're completely different than what I would normally eat (I'm talking about you, bacon...ranch dressing...steak...etc. ), so I knew that they would feel "new" (if that makes any sense) to me, and I'd probably feel more satisfied because I wouldn't be bored with eating the same things. A KETO diet is high in fat, moderate in protein, and very low-carb (which turns the body into a fat burning machine!) On a ketogenic diet your body switches its fuel supply to run almost entirely on fat. In return, fat burning increases which is wonderful if you’re trying to lose weight, but there are other benefits like less hunger and a steady supply of energy (my biggest reason for wanting to try it.) With this diet it's important to track EVERYTHING you eat so that you get into ketosis (I created this Pinterest board that has a bunch of charts that has helped me learn what to eat and what to avoid), but once you do that for a few days or a week it's easy to get the hang of it and know what you should or shouldn't be eating. The first 3-4 days weren't really that hard because I never felt hungry. I actually felt way more satisfied. Day 4 I felt kind of crappy (I think they call this the KETO flu), but once I hit day 5 I felt so good and had a ton of energy! Shortly after I started (about 3 weeks or so ago, so I'm still new to this too) I found out my girlfriend Blayne has been doing it. She's had a lot of success with it and feeling the best she's felt in a long time and has lost a lot of weight. She has been a tremendous support system to me, especially that first initial week when I had a ton of questions. Her and her sister started this Facebook page that you can join to see sample meal plans, ask questions, hear from others who are on the diet, etc. They didn't ask me to post about this at all - I just wanted to share in case any of you want to try a KETO diet as well! They know much more about this diet than I do! 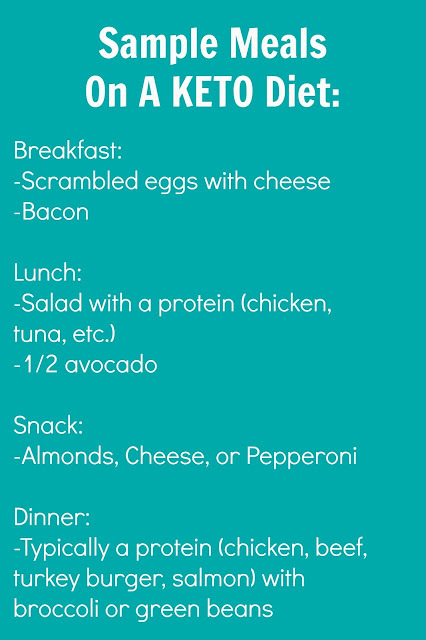 Since I received a ton of questions about this diet on my snapchat and what I eat everyday, I wanted to put together a quick graphic showing what I eat on daily basis. Please keep in mind there are SO many different things you can eat, or yummy recipes you can make on this diet (search on Pinterest! ), so these are just things I like to eat. Two big things that I've learned: If you drink coffee, you should switch out the creamer for heavy whipping cream. And also it is pretty easy to stick to this diet when eating at restaurants or at fast food places! For example-at Wendy's you can get a double cheeseburger without the bun. They will wrap it in lettuce if you ask for it. Once I've followed this diet a little bit longer I can do a more detailed post, if that would interest some of you! Do any of you follow a KETO diet or heard about it?! Share with me! I've hard about it a little bit but not much. The idea of diet-friendly heavy whipping cream in coffee is intriguing! I just started. And I've joined that fb group! So far it's not been terrible. But the weekend isn't here yet. This sounds similar to Atkins, I wonder if there are any differences? Just make sure you drink A LOT of water to help flush your system. High protein/ fat diets are hard on the kidneys, so staying hydrated will help. Good luck! What types of fish do you buy and how to you cook it? Im always clueless when it comes to grilling or cooking fish. I dont like super fishy tasting fish.